Pearl Jam frontman Eddie Vedder paid tribute to his fallen friend, the late Chris Cornell of Soundgarden, during a June 6 solo performance at the Eventim Apollo in London, UK. Cornell died in a Detroit hotel room on May 17 following a Soundgarden show in the city. The two members of the Seattle music community shared a long friendship in the years following Vedder’s 1990 arrival in town to audition for Pearl Jam. 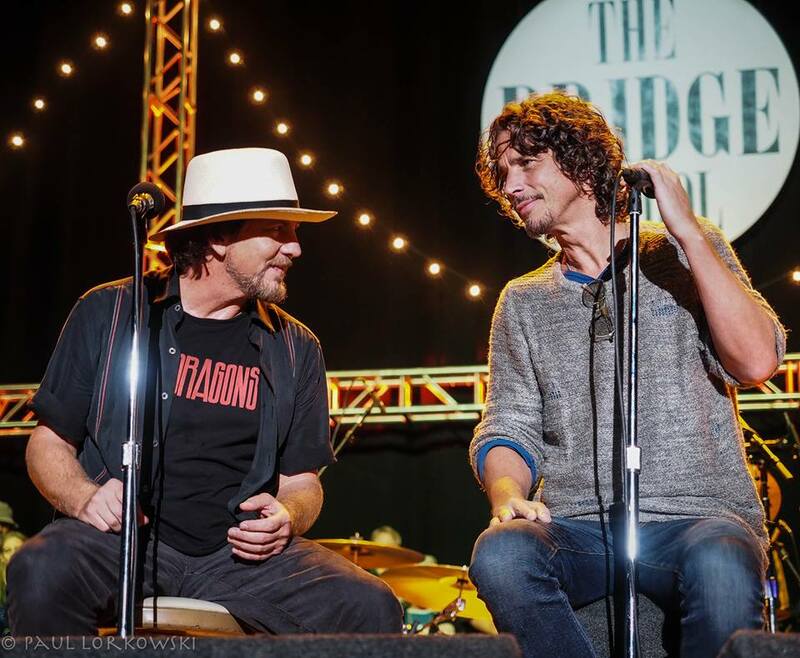 Cornell enlisted the rocker to join him on a duet of “Hunger Strike” for his Temple Of The Dog album tribute to Mother Love Bone singer Andrew Wood, who died earlier that year of a heroin overdose; the project also featured ex-MLB and future Pearl Jam members Stone Gossard, Jeff Ament, Mike McCready and Matt Cameron. Currently playing shows on a solo tour of Europe, Vedder reportedly shared his thoughts on the Cornell tragedy for the first time publicly during the first of two nights in the UK capital, according to a transcript shared on a Pearl Jam messageboard. “I'll say this too,” he continued. “I grew up as 4 boys, 4 brothers and I lost my brother two years ago tragically like that in an accident and after that and losing a few other people, I'm not good at it, meaning I'm not...I have not been willing to accept the reality and that's just how I'm dealing with it. “About two days after the news,” Vedder revealed, “I think it was the second night we were sleeping in this little cabin near the water, a place he would've loved. And all these memories started coming in about 1:30am like woke me up. Like big memories, memories I would think about all the time. Like the memories were big muscles. At the conclusion of his tribute, reports indicate Vedder received a standing ovation from the London crowd. Cornell’s passing was ruled a suicide by hanging by The Wayne County Medical Examiner's Office. An autopsy later revealed the singer had several prescription drugs in his system when he was found in the bathroom of his room at the MGM Grand Detroit, including Naloxone (Narcan), Butalbital (sedative), Lorazepam (Ativan), Pseudoephedrine (decongestant) and barbiturates, and it appears the rockers had taken 4 (1 mg) Lorazepam tablets. “Many of us who know Chris well, noticed that he wasn’t himself during his final hours and that something was very off,” said Cornell’s widow, Vicky. “We have learned from this report that several substances were found in his system. After so many years of sobriety, this moment of terrible judgement seems to have completely impaired and altered his state of mind. Cornell was laid to rest during a private memorial service at the Hollywood Forever Cemetery in Los Angeles on May 26.